Rafal Brzeski, Polish knife maker from Legnica, started making knives in 2013, and transformed this passion into a profession in 2015, becaming full-time knife maker under the name ‘Brr (Brzeski Rafał robił = made by Rafal Brzeski). The idea of creating knives by himself was born both for reasons related to his passion for speleology (where the knife becomes a fundamental tool) and for the fact that in Poland, when he was a boy, it was difficult and expensive to find custom folding knives. In a very short time, Rafal managed to make himself known internationally, thanks to the quality and designs of his knives. From the meeting with the Chinese Company WE Knife in 2018, a collaboration was formed that led to the large-scale production of the custom Wasabi knife designed by Brzeski. The folding knife, which will be presented at Bladestock 2018 (which will be held on June 30th and July 1st in the Netherlands) and of which we have the prototype, has a blade length of 100 mm, 26 mm wide and 4 mm thick; it features a wharncliffe style with a small swedge that extends almost the full length of the spine. The steel used is the M390, a third generation powder steel produced by Bohler, among the most appreciated by knife fans as it combines excellent edge retention with excellent corrosion and wear resistance. The blade rotates on ceramic ball bearings around a pivot marked with the WE Knife logo on one side, and on the other side is the adjustment / disassembly screw which in this model is T8 torx gold color (like all the other screws on this model). The only opening system is the flipper (the blade is in fact free of the thumb-stub); the flipper tab is really minimalist and protrudes very little from the handle profile when the blade is closed, while it disappears between the frames when the blade is open. This aesthetic solution is a bit detrimental to the functionality, as it makes the flipper tab not so practical to reach and activate in any condition. The locking system is the frame-lock type, whose flat spring is obtained on the titanium frame and is equipped with a steel insert that acts both as an interface with the blade tang and as a system to avoid the hyperextension of the spring in closing phase; moreover, a ceramic detent ball is housed on the insert. The handle is made of two sturdy 4 mm thick titanium frames with satin finish and gray anodization, separated by a spacer also in titanium with the same finish, as well as the pocket clip which is placed in tip-up position and is not configurable otherwise. Comparing the WE Knife Wasabi with the custom version produced by Brzeski, we can see how the Chinese company has remained as faithful as possible to the original design and also with the manufacturing quality. The differences are really minimal, but clearly the custom piece of the Polish knife maker has a greater attention to detail, such as the peculiar milling for the thumb positioning made on the blade spine together with those made on titanium frames. Being a prototype, we have not tested the cutting skills of the knife from the qualitative point of view so we could only focus on an analysis of the tool from the aesthetic and ergonomic point. The Wasabi is a sturdy folding knife that maintains the elegance of a gentleman's knife; comfortable to carry and light (with its 114 g), but at the same time functional and practical (maybe not so much in the case of the flipper-tab that is very small and hence not very comfortable). 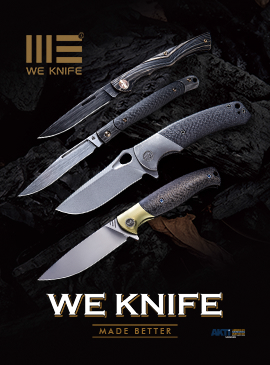 The WE Knife Co. Wasabi will carry an MSRP of $348. 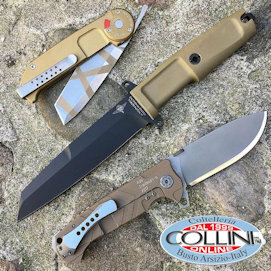 Once again the WE Knife Co. amazes for its precision and of manufacturing, for the choice of the highest quality materials and also for the interesting collaborations that they are currently starting.